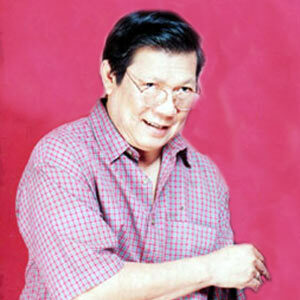 Pete Roa, former TV host and husband of actress Boots Anson-Roa, passed away today. He was 67. Last May, the 50th anniversary show of Tide was the last public appearance of Pete Roa, husband of actress Boots Anson-Roa. Pete Roa passed away at 4:32 pm today, August 9. He was 67 years old. Pete was confined several times at the Intensive Care Unit of Capitol Medical Center. Besides stomach cancer, he was also suffering from glaucoma and diabetes. Last year, he suffered complications of emphysema and pneumonia. Looking back, Pete Roa was the popular TV host of the '60s show Dance O' Rama of then Channel 5. His co-host was Baby O'Brien. Eventually, in came Baby's replacement, Boots Anson, then a popular campus figure and daughter of veteran actor Oscar Moreno. A TV romance bloomed, Pete and Boots eloped and got married in 1964. They were blessed with four children: Leah, Joey, Chiqui, and Ben. Moving to ABS-CBN, Pete had several achievements on his own, away from his famous wife's showbiz career. Pete directed the first television broadcast of the visiting premier Russian dance company, the first zarzuela aired on television, the first children's show Romper Room, and the first motorbike grand prix aired on TV. He was also the first director of the quintessential '70s talk show Two for the Road, starring the late Elvira Manahan and respected columnist Nestor Torre, who eventually took over the directing job. Later, Pete directed the pioneer noontime variety show, Stop, Look, And Listen. In 1981, the whole Roa family visited the United States and eventually settled in Washington D.C. in 1982, when Ms. Anson-Roa was appointed as the Press Attaché and Cultural Officer of the Philippine Embassy and as Commissioner of the Commission on Population. They returned in 1993 and Boots resumed her acting career. Pete's remains lie in state at the Arlington funeral parlor, Araneta Avenue, Quezon City.